Midsize sedans are great for nearly any situation. With lots of space, comfort, and safety, they’re ideal for long drives and your day-to-day errands around Avon, Indianapolis, and Plainfield. So, which one offers you more of what you’re looking for in your next car? Andy Mohr Toyota helps you decide with this 2018 Toyota Corolla vs. Honda Civic comparison. The 2018 Toyota Corolla is a versatile sedan that’s well equipped to get you anywhere you need to be with reliable performance and safety. The 2018 Toyota Corolla safety package starts with a design that features a head-impact protection structure made with high-tensile-strength steel body panels. Plus, a series of front and rear energy-absorbing crumple zones, with side-impact door beams, helps distribute energy away from passengers during a collision. The built-in safety continues in the interior where there’s eight standard airbags including a driver and front passenger Advanced Airbag System, driver and front passenger seat-mounted side airbags, driver knee airbag, passenger seat-cushion airbag, and front and rear side curtain airbags. Because of the smart design and Star Safety System™, the Toyota Corolla was named a Top Safety Pick by the Insurance Institute for Highway Safety (IIHS). The 2018 Honda Civic has some of these safety features, but it has fewer airbags and didn’t receive the same high safety rating from IIHS. The Toyota Corolla trims feature a sleek design that’s both stylish and sporty. It has a narrow-pointed grille that transitions into a large, wide descending air intake. Above that, there’s a raised hood with aerodynamic accent lines. This look continues along the sides with modern-looking accents. Together, these design features help give it a tight streamlined look from front to back. By contrast, the 2018 Honda Civic is very round. Both the front and rear seem to have no corners and its hood looks like a dome. It doesn’t feature the same well-thought-out stylish appeal. 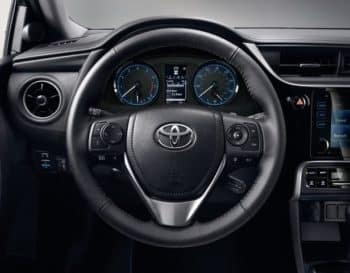 When you first take a seat inside the 2018 Toyota Corolla, you’ll find a sporty interior that will give you and all your passengers a comfortable and fun ride. There’s seating for five, including a spacious back seat with 41.4 inches of legroom. 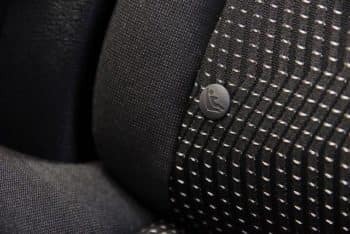 There are lots of options for your seating trim, like premium cloth or SofTex® to give the interior the real feel of a sports car. The great thing about the seats, though, is that they’re actually part of the safety system. There are Whiplash-Injury-Lessening front seats and Lower Anchors and Tethers for Children (LATCH) for smaller riders in the back. The 2018 Honda Civic also has a nice interior that features several seating trim surfaces, but it gives backseat passengers a more cramped ride with only 37.4 inches of legroom. It also doesn’t have seats designed to counter whiplash. Should I Get the Corolla or the Civic? If you’re looking for a safe and stylish ride with lots of a comfort and sporty feel, the 2018 Toyota Corolla is an excellent choice for all your drives around Avon, Indianapolis, and Plainfield. To take one for a test drive or learn more about this 2018 Toyota Corolla vs. Honda Civic comparison, visit us at Andy Mohr Toyota.